"I made six movies with Lex Barker," Walter Barnes remembered and revealed to his interview partners that he liked the man very much. He recollected how painful it had been when Lana's daughter destroyed the reputation of his friend after he had died and could no longer defend himself. "But that doesn't negate how good Lex was as an action star, even if movies like Robin Hood and the Pirates aren't the means with which to convince skeptics." Walter Lee Barnes came into this world on 26 June 1918 in Parkersburg, West Virginia. When he was only a young child he already made an impression with his robust build, and when he nabbed a piglet his nickname was set. From then on his friends only called him 'Piggy'. However, the gibe didn't apply at all to the athletic prowess of the young, hefty man, on the contrary. Barnes, just like many others before and after him, recognized that the paths on American universities became a lot smoother with the display of one's sporting skills. 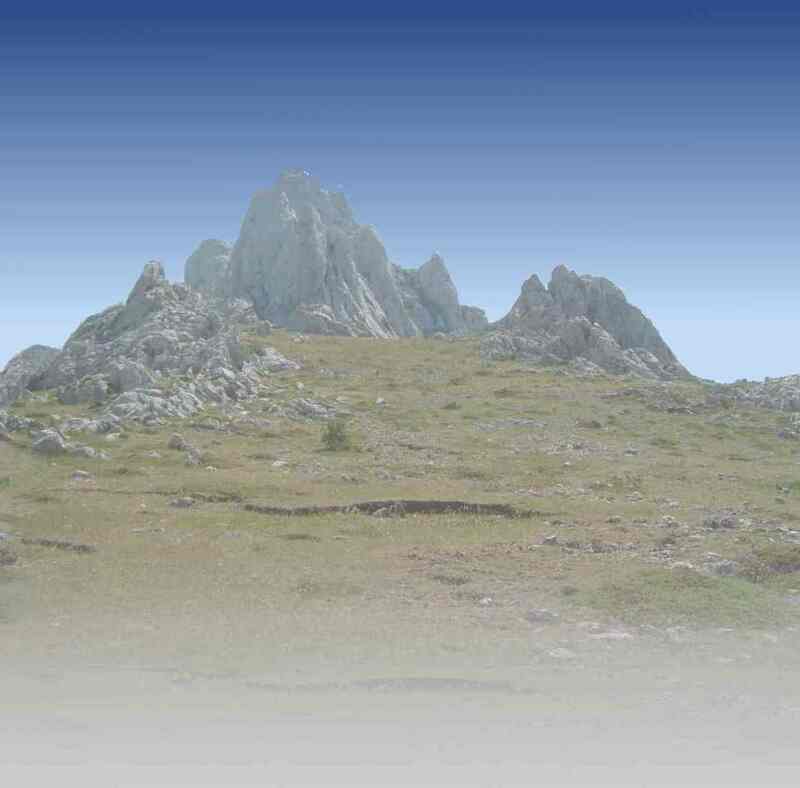 His path ascended steeply. Very quickly Walter Barnes became a recognized figure in American football and created a furor in the business together with his Louisiana State University team. After a successful and active sports career he turned professional lines judge in 1950/51 with the Philadelphia Eagles football team. Thanks to his popularity Walter Barnes received the occasional invitation to appear on the regular television sports show The Eagle's Nest, which was his first encounter with a new profession. But first, Barnes became the coach of a number of successful university football teams, like Columbia University and Arizona State university. To coach the Winnipeg team in the Canadian football league became the pinnacle of his trainer's career. The name 'Walter Barnes' became a household name to everyone who had an interest in American football. And so it came as no surprise when the film industry discovered Barnes' star potential and WCAU in Philadelphia (Pennsylvania), a television station with which he was familiar, offered him his first opportunity in show business. An actor who was capable of getting through the occasional stunt without extensive preparations was required for a live western show. And a football actor is no wallflower after all. Understandably, the show carried the promising title Action in the Afternoon; to be precise it was a kind of western play with the difference that an entire television audience was being entertained instead of just a few local spectators. During a total of one hundred and thirty episodes, Barnes was required to risk his limbs. The series truly wasn't a highlight of American television culture, but for Walter Barnes it was a school that stood him in good stead for his later career. The additional notoriety that Barnes had attained in this manner gave him his own television series The Adventurer, where he played Captain Nemo. The series ran for an entire season in 1954/55, with an impressive two hundred and fifty shows. "Animal footage of big game hunting in Africa or of deep sea fish were added to all of my scenes. My friends asked me to take them along, but I never got any farther than the bar at the end of the street." A year later, thanks to his good connections to Warner Brothers producer Art Silver, Walter Barnes gave his Hollywood debut in the series Cheyenne, (episode 'The Trap'). Other roles followed in such television western classics as Gunsmoke, Maverick, or Death Valley Days. But for Walter Barnes the role of a television hero is not enough. He also wanted to make an impact on the big silver screen. But that was easier said than done. Despite his very famous exponent, one of the greatest football fans of the U.S.A. and cowboy of the nation, John Wayne, Barnes didn't get a major screen role. He managed to get a hold of a short, quite interesting appearance as the saloon barman in the classic Rio Bravo, but other than that only minor parts in a few second-rate westerns came his way, such as the movie Revolt in the Big House (1958), and Westbound (1959). Oregon Passage, an insignificant cavalry western had already served as Barnes' screen debut in 1958, however, that didn't amount to a Hollywood career. Just like countless others among his colleagues, only an escape to Europe was left to him to get his hands on bigger and more attractive film roles. In addition, Walter had seen the Italian movie La Strada, made by a certain Federico Fellini, and would have liked to work with that director. In fact, one film offer did lead him to Europe. 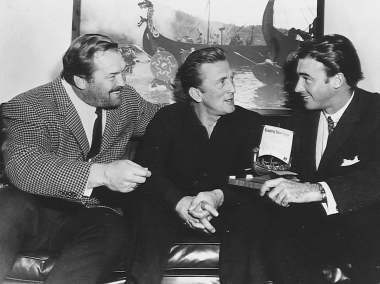 Kirk Douglas won his fellow countryman, who had grown slightly less sporty in the meantime, a major role in the period series Tales of the Vikings, where Barnes played the suitable role of Viking Finn. "I met my German wife Britta, she was in the series." The marriage only lasted a few years. Barnes met many familiar American faces again in sunny Rome and a close long-term friendship developed between them. "To live in Italy during the 1960s was like living in paradise. We organized many parties. There were people like Guy Madison, Gordon Scott, Lang Jeffries, Brett Halsey and Wayde Preston. We were working and I was making several films with Barker." After the television series the American finally succeeded in finding his way into motion picture history. 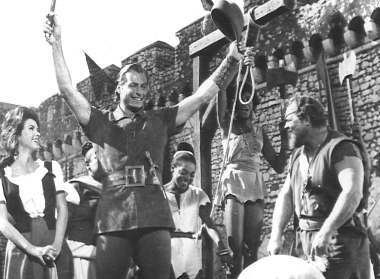 Although not in a Fellini movie — he rejected an offer by the Italian due to ignorance — but Walter Barnes cut a fine figure riding the pirates movie wave. He had no problems at all portraying 'seadogs', old experienced sailors. 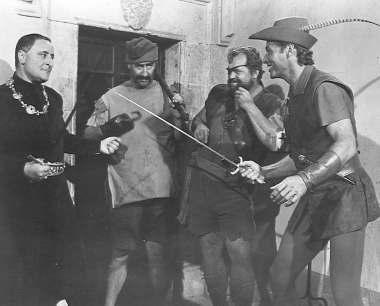 Even if the plots were oftentimes similar, the appearances of the physical heavyweight, Walter Barnes, remained memorable for the audience in movies such as Unter Zehn Flaggen (Under ten Banners, 1960), Piratenkapitaen Mary (Pirate Captain Mary, 1961) and Raecher der Meere (Avenger of the Seas, 1962). His acquaintance with Lex Barker brought him further parade roles and his induction into the Winnetou series. In addition to the aforementioned movies he also starred with Old Surehand Stewart Granger in Frontier Hellcat (1964) and Rampage at Apache Wells (1965). Even years later, Walter Barnes was proud of his Karl May movies: "May was the German author who created Winnetou, Old Shatterhand and Old Surehand — while he sat in prison. Every child in Sweden, Holland and Germany loved Karl May. We shot those movies in Yugoslavia and Berlin, and I worked with Lex Barker as Old Shatterhand and Stewart Granger as Old Surehand, and naturally Pierre Brice who held the lead part of Winnetou in all movies." During the filming a genuine friendship connected Walter Barnes especially with the Frenchman, more than with any other actor. On the tide of the Karl May westerns, Barnes effortlessly transferred to the wave of European westerns: some of the often questionable works were titled Duell vor Sonnenuntergang (Duel before Sundown, 1965), Nevada Clint (1966), Der Gehetzte der Sierra Madre (The Hounded of the Sierra Madre, 1966), Ein Halleluja fuer Django (A Hallelujah for Django, 1967) or Django — ein Sarg voll Blut (Django — A Coffin full of Blood, 1957). "I played the fathers of Mario Girotti and Peter van Eyck. During my career I was often cast as a father figure because I had those looks." At Marie Versini's side Walter Barnes appeared in the espionage thriller Liebesnaechte in der Taiga (Romantic Nights in the Taiga, 1967). Marie Versini: "We had many beautiful scenes together in this movie, because Walter helped me to escape through the Taiga together with Thomas Hunter, and protected us. Walter and I became very good friends." Together with Goetz George, his on-screen son from Frontier Hellcat, Barnes also starred in Inspector Bloomfields groesster Fall (Inspector Bloomfield's Greatest Case, 1968). In the end, the European movie industry had no further roles to offer him. However, Barnes made a seamless transfer to the States. Already in 1969 he rode again, namely in Bonanza (Episode: Anatomy of a Lynching). He commented on his comeback in America: "I was a new face — people had not seen me before." Unlike Lex Barker he didn't have to contend with a stereotype image. From then on, Walter Barnes regularly appeared in the most well known television series. He also guest-starred in Mission: Impossible, Kung Fu and Kojak, as well as more Bonanza episodes, even in North and South (1985), a production that advanced to a classic in the meantime. As if that wasn't enough, after rekindling old contacts, Walter Barnes also participated in a series of remarkable motion pictures. He joined his old friend John Wayne, to play 'Sheriff Grady', in the western Cahill U.S. Marshal (1973). Together with someone he still knew well from their times in Italy, Clint Eastwood: "I love Clint Eastwood — he's so easy to work with," he starred in more westerns; as 'Sheriff Sam Shaw' in High Plains Drifter (1973), 'Tank Murdock' in Every Which Way But Loose (1978), where he even emerged the winner from the fight scene with Clint, as well as in Bronco Billy 1980) as another law man, 'Sheriff Dix'. Barnes gave his farewell from the silver screen in 1984 as 'Doctor' in Daddy's deadly Darling. After the lead role in the western series Walking Tall (eight episodes) in 1981, Barnes' last television appearance could be observed by the attentive viewer on 25 March 1986 in the crime series Stingray, episode Ether. Walter Barnes lived a quiet and private life during the ensuing years. Every now and then he was invited as a celebrity guest to football parties or western film festivals. Walter Barnes died on 6 January 1998.